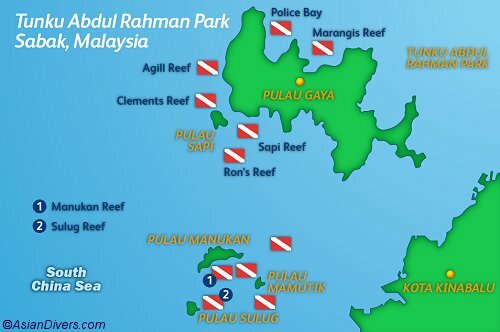 The Tunku Abdul Rahman Marine Park features several dive sites accessible from Kota Kinabalu. Think of a dream come true and this will be no other than the Tunku Abdul Rahman Marine Park made up of 5 beautiful islands. There is plenty to feed your eyes on, for the park boasts of a diverse marine life such as; mantis shrimps, hawksbill turtle, cuttlefish, scorpion fish and many more. To get to this breath-taking park, you need to board a speedboat from the town of Kota Kinabalu. The journey is not going to be as long, for it will only last for not more than twenty minutes. While at Tunku Abdul Rahman Marine Park, you will be spoilt for the activity to engage in. For one, you can visit a research center that deals with marine ecology and you will learn one or two things about environ mental care. If it turns out that this is not you kind of thing, you have a choice of taking a walk in the captivating mangroves. For those who are intrigued by the past, a marine museum extends its welcoming hands to you. One can also enjoy a cool swim in the see or better so take one in the magnificent pool at your disposal. For those who are not faint hearted scuba diving coupled with other water sports will definitely make your day. When one is a guest at Tunku Abdul Rahman Marine Park, there is really no need to worry about where to spend a night. Various Islands provide varied accommodation. For instance at Manukan Island you will get chalets for rent, and in the restaurant a buffet to boot. There is a shop, picnic chairs are available and so are Scubadoo undersea scooters. Other activities that will make you not think of never leaving Tunku Abdul Rahman Marine park are the shallow corals, and taking photographs under water. Snorkeling is there for taking for those who have water phobia or better so they can take the pleasurable sea walk along the Sapi Island shores.